Spotted stemborer | Infonet Biovision Home. Spotted stemborer (Chilo partellus) - Adults are relatively small moths with wing lengths ranging from 7 to 17 mm (1.7cm). (c) Georg Goergen/IITA Insect Museum, Cotonou, Benin. Reproduced from the Crop Protection Compendium. Chilo partellus is found in Ethiopia, Sudan, Somalia, Kenya, Tanzania, Uganda, Mozambique, South Africa, Swaziland, Lesotho, Zimbabwe, Zambia, Malawi and Botswana. The spotted stem borer is one of the most important stem borers in East and Southern Africa. This pest is not native to Africa, but was accidentally introduced from Asia. It is essentially a pest of hot lowland areas, and it is seldom found above an altitude of 1500 m. Since its appearance on the African continent, it has continuously expanded its distribution in the warm, low-altitude regions of eastern and southern Africa. It is now the most economically important stem borer in many areas. 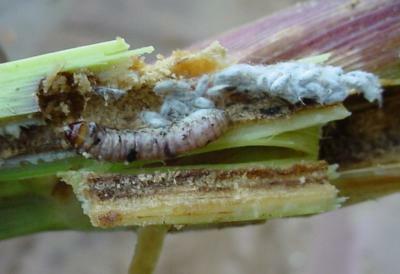 In Africa, the spotted stem borer is a major pest of maize, sorghum and pearl millet. Young caterpillars of spotted stem borer feed on the tender leaves of the plants. They later feed at the growing point into the stem. Seriously attacked plants dry-up entirely or partly showing the so-called 'dead heart' symptom. Early attacked plants are stunted in growth and the ears are poorly developed. Stem tunnelling by older caterpillars interferes with transference of nutrients to the grain. 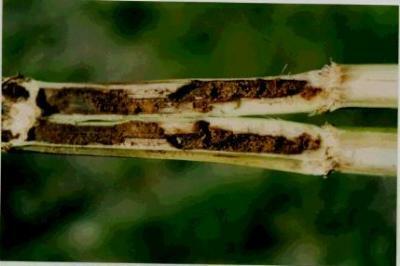 Stem borer damage results in plant stunting, lodging, stem breakage, and direct damage to ears. Infestations by stem borers increase the incidence and severity of stalk rots and may increase the contamination of the grains with toxin-producing fungi like Aspergillus flavus. 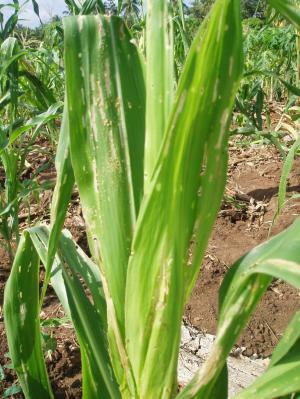 The spotted stem borer is an important pest of cultivated cereals, especially maize, sorghum and pearl millet (Pennisetum glaucum). It has also been recorded from wild grasses and mainly wild sorghum. Leaves show irregular scars, holes and windows caused by the feeding of young caterpillars. Seriously attacked plants, especially young plants dry-up entirely or partly showing the so-called 'dead heart' symptom, due to the death of central leaves. The longitudinal dissection of the stalks reveals the caterpillars. In older plants the upper part of the stem usually dies due to the boring of the caterpillars in the stem. 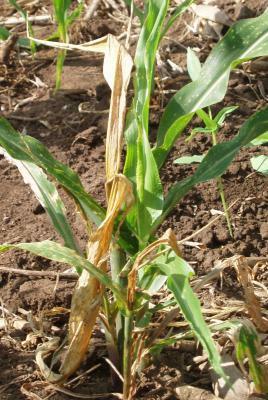 Older caterpillars tunnel extensively in stems and in maize cobs, weakening the stems, which may break. Damage to inflorescences may interfere with grain formation, causing chaffy heads in sorghum. 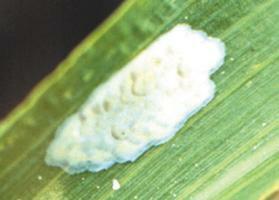 Similar symptoms are produced by other species of cereal stem borer. Ear/head, growing points, leaves, stems. Ear/head: internal feeding; external feeding. Growing points: internal feeding; boring; dead heart. Leaves: external feeding; internal feeding. Stems: internal feeding; dead heart. Eggs are flat and oval, creamy-white and about 0.8 mm long. They are laid in overlapping batches on the underside of a leaf near the midrib. They hatch after 4 to 10 days. Caterpillars are up to 25 mm long when fully grown, with a prominent reddish-brown head. The body is creamy-white to yellowish-brown, with four purple-brown longitudinal stripes and usually with very conspicuous dark-brown spots along the back, which give them a spotted appearance. Young caterpillars initially feed in the leaf whorl. Older caterpillars tunnel into stems, eating out extensive galleries. In warm conditions larval development is completed in about 15 to 20 days. Caterpillars pupate in damaged stems. Pupae are up to 15 mm long, slender, shiny and light yellow-brown to dark red-brown in colour. Adults emerge 5 to 12 days after pupation. Adults are relatively small moths with wing lengths ranging from 7 to 17 mm and a wingspan of 20 to 25 mm. The fore wings are dull, generally light yellow-brown with some darker scale patterns. The hind wings are white. Adults emerge from pupae in the late afternoon or early evening. They are active at night and rest on plants and plant debris during the day. They are seldom seen, unless disturbed. The whole life cycle takes about 3 to 4 weeks, sometimes longer in colder months, and shorter in hot months. Five or more successive generations may develop in favourable conditions. In regions where there is sufficient water and an abundance of host plants, Chilo partellus normally develops continuously all year-round. 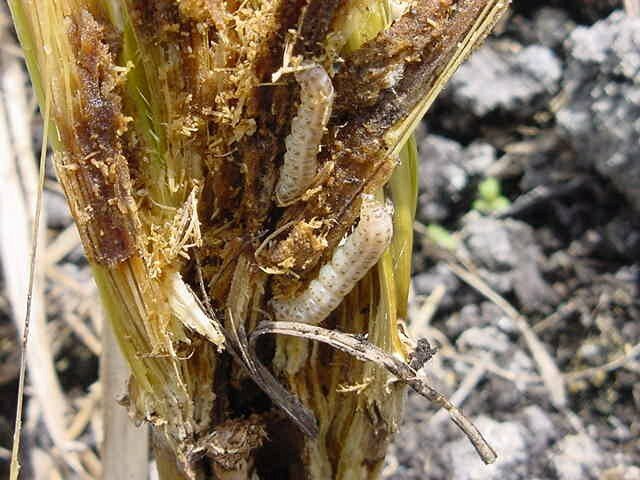 In other regions with long dry periods in winter or in summer, the spotted stem borer, as with many other cereal stem borers, pass the winter or dry season as fully-grown caterpillars in a resting period (diapause) in stems and stubbles in the field. They may remain inactive for up to six months, before pupating and completing their development early in the following growing season. 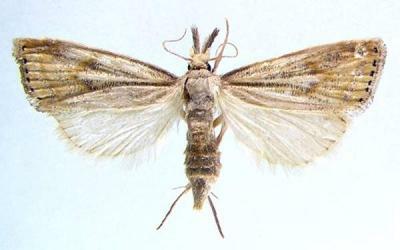 In Kenya, the spotted stem borer diapauses for several months in the dry season. However, populations without a resting period were reported from the Coast Province of Kenya and Uganda. In the coastal areas of Kenya, in periods between cropping seasons, some stem borers diapause in maize stubble, whereas others remain active, feeding in wild grasses such as wild sorghum. This illustration shows the methods promoted on infonet-biovision. The methods shown at the top have a long-term effect, while methods shown at the bottom have a short-term effect. In organic farming systems, methods with a long-term effect are the basis of crop production and should be used of preference. On the other hand methods with a short-term effect should be used in emergencies only. On infonet we do not promote synthetic pesticides. Further below you find concrete preventive and curative methods against Spotted stem borer. 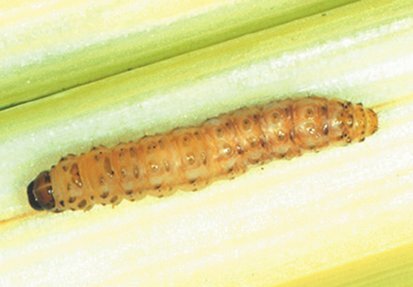 Infestations of stem borers are detected by walking through young crops looking for characteristic feeding marks on funnel leaves, the presence of dead hearts and holes in tunnelled stems. Samples of affected stems are then dissected to retrieve caterpillars and pupae. As other stem borers cause similar symptoms, retrieval of caterpillar or pupae and confirmation of their identity by rearing adults for identification by a taxonomic specialist is essential to ensure a correct diagnosis. The presence of this species in older crops and in crop residues may be detected by taking random samples of stems or stools for dissection. Practise good crop hygiene, this includes the destruction of crop residues (stems and stubbles). Remove volunteer crop plants and/or alternative hosts. This reduces carryover of stem borers from one growing season to the next, and will help to limit the most damaging attacks on young crops early in the growing season. Manipulation of sowing dates may also be used to avoid periods of peak adult activity. However, this is not practical in situations where lack of water is a major constraint as farmers often plant after first rains. Manipulation of sowing dates may also be used to avoid periods of peak adult activity. Studies on several stem borers in Africa showed that soil nutrient levels, such as nitrogen, greatly influenced nutritional status of the plant, and the plant's tolerance to stem borer attack. Although an increase in nitrogen is related to higher pest loads and tunnel damage, there is also an increase in plant vigour with a net benefit to the plant reflected in lower yield losses (Setamu et al., 1995). 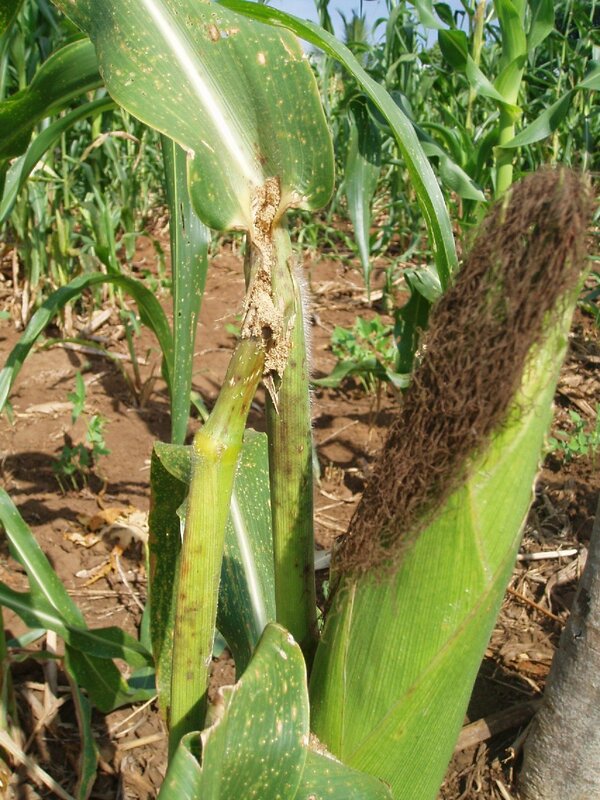 Trials in Tanzania to evaluate the effect of nitrogen fertilisation (0,50,70,100 kg N/ha) on pest abundance, plant damage and yield loss of maize due to stem borers showed the beneficial effect of nitrogen on the maize plant's abilities to compensate for damage by the spotted stem borer. Yield loss decreased with an increase in nitrogen application and the effect was stronger under high than low borer infestation levels (ICIPE, 2005; Mgoo et al., 2006). 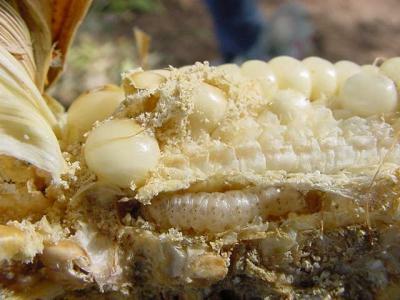 The importance of plant biodiversity in maize agroecosystems for reducing borer's infestation on maize has been recognised in sub-Sahara Africa. Studies have shown that intercropping maize with cowpea is an effective way of reducing damage by the spotted stem borer caterpillars migrating from neighbouring plants. The effect is variable, if the crop to be protected is not planted after the companion crops. Intercropping maize with molasses grass (Melinis minutiflora), which is a non-host for stem borers, significantly reduced stem borer infestation on maize. A significant increase of parasitism of stem borers by the wasp Cotesia sesamiae was also observed. 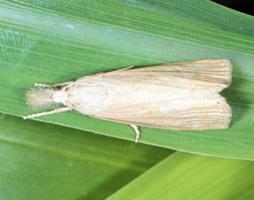 Molasses grass produces volatile agents, which repel stem borers but attract the parasitic wasp. In addition, the molasses grass is an effective cover crop and provides good fodder for livestock. Greenleaf desmodium (Desmodium intortum) repels egg-laying stem borer moths, and in addition, when intercropped with maize, suppresses and eliminates Striga. Planting an outer encircling row of some highly preferred hosts as trap plants is another useful diversionary tactic for management of stem borers. Examples of trap plants are Napier grass (Pennisetum purpureum) and Sudan grass (Sorghum vulgare sudanense), common fodder plants in Africa. Napier grass is highly attractive to egg laying moths, but only few caterpillars complete their lifecycles, since when they enter the stem the plant produces a gummy substance that kills the caterpillars. Sudan grass provides natural control of stemborers by acting as a trap crop (attracting moths) and as a reservoir for its natural enemies. A simple habitat management strategy has been developed combining use of intercropping and trap crop systems. The strategy is known as "Push-Pull", whereby farmers use Napier grass and Desmodium legume (silverleaf and greenleaf desmodium) as intercrops. For more information on push-pull click here or refer to www.push-pull.net (click to follow link). Two parasitic wasps that attack stem borers were introduced from Asia into East Africa: Cotesia flavipes and Xanthopimpla stemmator. Cotesia flavipes is a small wasp that attacks caterpillars of the spotted stem borer in Asia. This wasp was imported, mass reared in the 90's, and subsequently released in East and Southern Africa. Cotesia flavipes locates the stem borers while the stem borers are feeding inside the plant stems. The wasp lays about 40 eggs into a stem borer. Upon hatching the larvae of the parasitic wasp feed internally in the stem borer, and then exit the stem borer and spin cocoons. This parasitic wasp is now established in several countries (Kenya, Tanzania, Mozambique, Uganda, Ethiopia, Zambia, Zimbabwe, Zanzibar, Malawi, Somalia) (Omwega et al. 2006; Kfir et al, 2002). Studies of the impact of this parasitic wasp in coastal Kenya showed that it has caused a 70% decrease in stem borer densities. 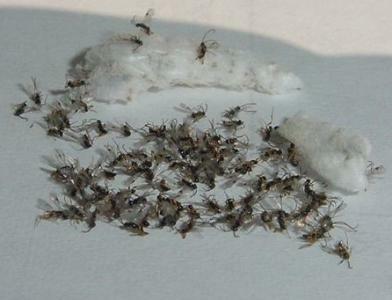 Xanthopimpla stemmator, a wasp attacking pupa of stem borers, has been recently imported, and released in several countries. Local natural enemies such as earwigs and ants are also important for control of stem borers included the spotted stem borer. Parasitised spotted stem borer caterpillar. Note cocoon of the parasitic wasp Cotesia flavipes. Neem products are effective for control of stem borers, including the spotted stalkborer. It is recommended that a small amount of neem powder (ground neem seeds) mixed with dry clay or sawdust at a rate of 1:1 is placed in the funnel of the plant. One kg powder should be sufficient to treat 1500 to 2000 plants. In this method rain water dissolves the active substances in neem powder as it gathers in the funnel and washes out the powder. Where rainfall is irregular a liquid neem seed extract can be sprayed into the funnel. The treatment should be repeated every 8 to 10 days during the sensitive growing phase. Thus, roughly three treatments are required per crop. This recommendation applies only for young plants before flowering and not for older plants. A mixture of ground neem kernels and sawdust (1:1) applied as granules at weekly and biweekly intervals reduced the number of maize plants attacked by the spotted stem borer by 60% and 40% respectively in field trials. In experiments in Somalia, pulverised neem kernel and kernel cake (0.5 g and 1 g per plant) alone or a mixture with clay, markedly reduced stalk borer damage and increased the yield in comparison with the check plots by over 100% (Hellpap, 1995). Hill, D. S. (1983). Agricultural Insect Pests of the Tropics and Their Control. Second edition. Cambridge University Press. pp 746. ISBN: 0-521-24638-5.